Here’s a great holiday dessert, easy to make, delicious, and gluten-free! Preheat oven to 375. Cut wax paper to fit an11’ X 16” jelly roll pan. Grease the pan well, fit paper into pan and grease paper. baking powder, Egg Re placer (if used), cinnamon, ginger, and nutmeg. Set aside. In a large mixing bowl, beat the eggs and sugar until light. Mix in the pumpkin and lemon juice. Add the dry ingredients and mix well. Pour into the prepared pan, spreading well so the batter is even. Bake for 15 minutes. Cool 15 minutes before turning out onto a clean, flat-textured tea towel that has been rubbed with powered sugar. Remove the paper and roll up (fro the 11-inch side) in the towel, folding some of the towel over the cake at the beginning. Let cool. 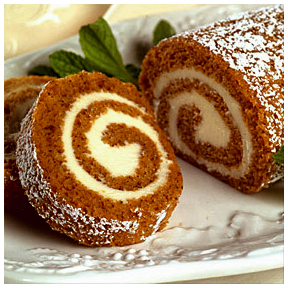 Unroll and fill with a thick spread of nondairy whipped topping flavored with the powdered vanilla. Re-roll without the towel and seal in foil. Refrigerate until serving. Makes 8 servings.